Baumer: With the specially developed IP 65/67 and IP 69K housing accessories, Baumer CX.I cameras can now be used to cover applications in the food, beverage and pharmaceutical industries, which set high standards regarding cleaning media or surface roughness in the splash or product contact zone. In thermal terms, the accessories are ideal matches for the cameras and turn them into IP 65/67 or IP 69K cameras in no time at all. This flexibility means that the right version is available for every field of application, with an optimum price-performance ratio. Series production begins in the 1th quarter of 2019. 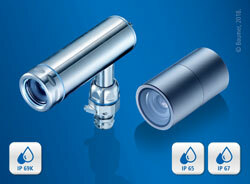 The IP 65/67 housing was developed in accordance with EHEDG guidelines. Thanks to its round shape, liquids flow off quickly without forming dirt pockets. The hard anodized surface also resists intensive cleaning processes. The washdown design of the EHEDG-compliant, IP 69K, stainless steel housing, eliminates the possibility of product residue adhesion, facilitates residue-free cleaning and prevents the formation of bacteria. With a surface roughness of less than 0.8 µm and food-grade, hard-wearing seals, it is also suitable for splash and food zones in which oils and greases or chemically aggressive cleaning media are used. The housing kits are supplemented by an extensive range of tubes to meet the various application requirements. Tubes are available with different cover glass materials such as acrylic glass or chemically strengthened alumino-silicate glass with high scratch, impact and fracture resistance as laminated safety glass for a long service life. The CX.I cameras with resolutions of up to 12 megapixels and up to 148 fps can withstand shocks of up to 100 g, vibrations of up to 10g, and have 4 power outputs with pulse width modulation and a power output of up to 120 W (max. 48 V / 2.5 A) to control lighting directly without an external controller. Models with an extended operating temperature range from -40 °C to 70 °C also allow for use in extremely demanding ambient conditions.